Terraced front lawns on the south-east side of the main school building which now accommodate the Clarendon Music Centre. The former West Herts Golf Club pavilion built in 1890 and which became an integral part of the school until 1956. Shepherds Lodge, on the corner of Shepherds Road and Rickmansworth Road, was once one of the lodges at the southern margins of the Cassiobury House Estate, at least until the school was opened in 1912. Shepherds Lodge was finally removed in 1954, almost three decades after the demise of the famous old mansion. I attended this famous old school from September 1954 until July 1961 and thus experienced some of the major changes which took place as the school continued to grow and develop. In the 1920s, only about 600 pupils were on roll, but this has more than doubled in the present century, to around 1,300 boys in 2013. A pleasant rurban/suburban view of West Watford in the interwar period, with the 1912 Grade II Listed building of Watford Boys' Grammar School occupying the middle background. Since the photograph was taken, the School has more than doubled in size, to more than 1,300 students, with a corresponding growth of modern outbuildings occupying the now-congested site. The neighbouring suburbs remain in place, adjacent to the vast open spaces of Cassiobury Park. The Grade II listed building of Watford Boys' Grammar School, constructed in 1911/12 on the north-west side of Rickmansworth Road and opened by the Earl of Clarendon on March 20th, 1912, occupies the centre of the photograph, together with the extensive grounds. The neo-Georgian facade conveyed the significance of the School, at least in the eyes of the Governors! On the west side of the main building is the former West Herts Golf Clubhouse (1890), which became known as the Old Pavilion. This wooden structure housed the gymnasium, changing rooms, a kitchen, two dining rooms and teaching rooms until demolition in 1956, to make way for the new Art & Technology block. The School Field initially provided space for football and later cricket, hockey and athletics, once it had been levelled after use for twenty years as the first hole on the golf course! 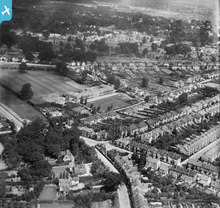 In the background is the 1920s' suburban development of Parkside and Cassiobury Drive, stimulated by the recent (November 1925) opening of Watford Met Station, just off to the left of picture. 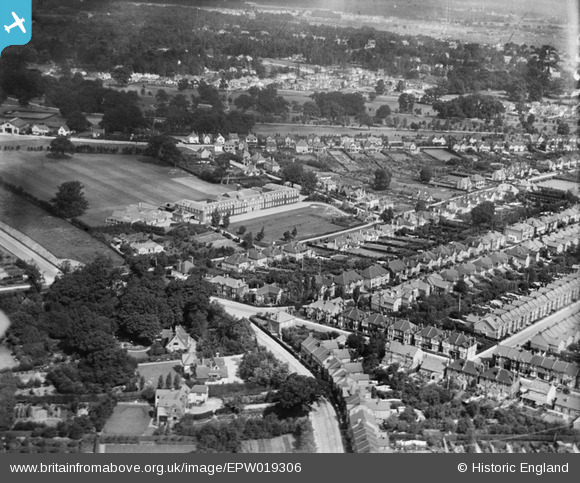 In the foreground is Hagden Lane and Queen's Avenue, east of which are the late Victorian rectilinear suburbs of West Watford.